Nobody is suggesting a begging bowl be organised for Tim Cook, the chief executive of Apple, but these are comparatively fraught times for the first company to be valued at over $1 trillion, which happened last August. Think about that for a second and then forget about it, because it’s no longer relevant. Turbulent times around the beginning of 2019 mean that Apple is now worth only two-thirds what it was last summer. That’s still one hell of a size of a company but unlike those halcyon days of five months ago Apple is now worth less than Alphabet (the owner of Google), Amazon and Microsoft. Unhappy New Year, Tim! It’s not a matter of there being no service (as indicated on the old iPhone shown on the home page) but part of the problem – in fact, the major problem – is that increasingly people are sticking with the phone they have rather than going to an Apple dealer and getting an upgrade on their existing one. When the iPhone 7 was unveiled in 2016, it was not regarded as much of an improvement on the iPhone 6, which had been released two years before to generous acclaim. ‘The camera is a bit better’, was about the sum of the praise for that. Pretty much that was all that anyone offered on behalf of the iPhone 8 when that came out in 2017. No one could deny that the family of iPhone Xs, which were launched last year (BTW, what’s wrong with the number 9? ), represented a substantial shift in appearance and performance. The difficulty is that most folk are reluctant to take out a huge loan to acquire a mobile phone, however smart it is. The price tag of the X has proved an impediment to sales, the consequence being that more purchasers of new phones are opting for the iPhone 8 than had been envisaged by the Apple business plan. 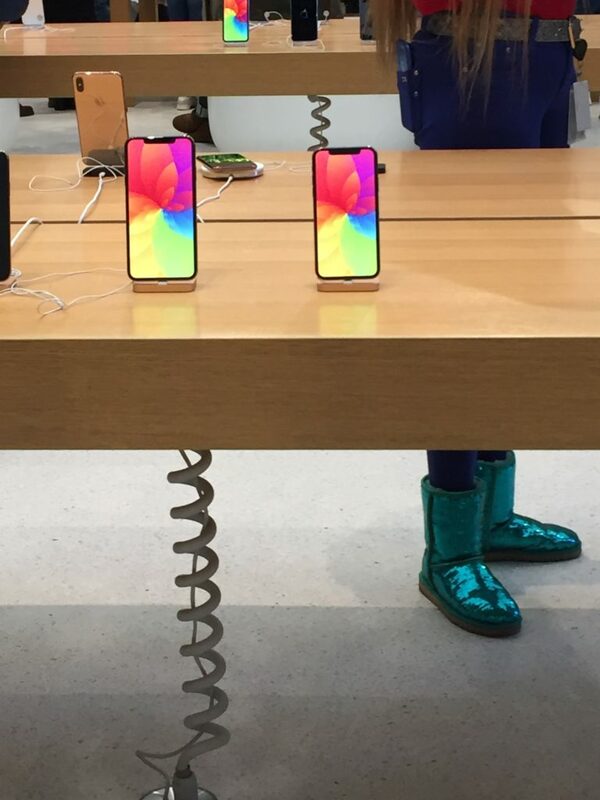 New iPhones alluringly on display at London’s Regent Street store: but will anyone be buying them? Even worse, some are abandoning iPhones altogether, and that definitely was not part of the prospectus. It’s also something that would not have occurred in times past. 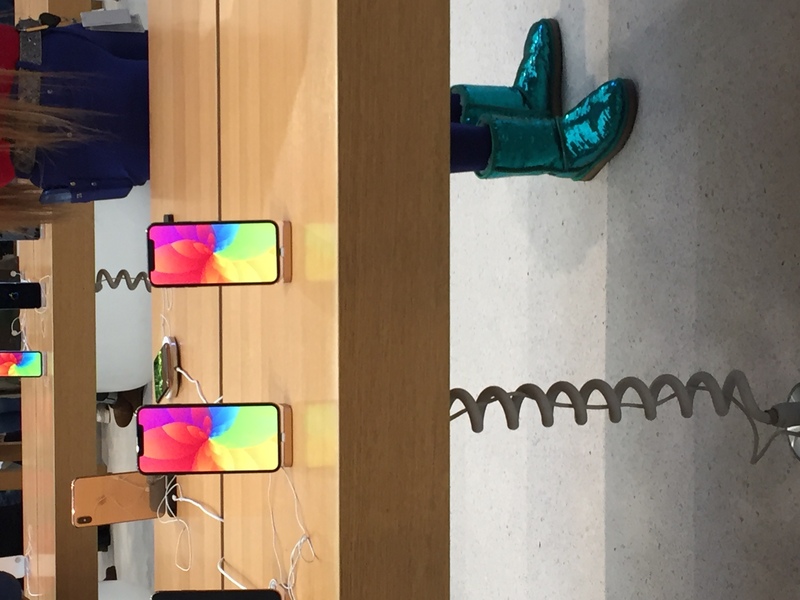 Brand loyalty to Apple products was, if not taken for granted, at least regarded as sure-fire as could be in such a competitive business environment as the high-tech market. And if problems with the US market were not enough, there is also the China check-out. The significant and unscheduled slowdown in the market there was responsible for wiping $75 billion of Apple’s stock-market value on January 3. Yep, in one day. “We did not see foresee the magnitude of the economic deceleration, particularly in greater China,” said Cook. You have to figure Cook also feels this might not be the most propitious time, especially as regards the interests of his business, for the president of his country to make out that he’s positively relishing the prospect of a trade war with his opponents in the orient. Although perhaps The Donald uses a Samsung?